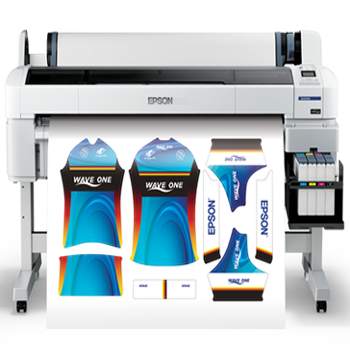 LONG BEACH, Calif., Aug. 11, 2015 /PRNewswire/ — As textile imaging continues the rapid transition from analog to digital, Epson America today bridges the gap further with the introduction of its next-generation SureColor® F-Series dye-sublimation transfer printers. The 44-inch Epson® SureColor F6200 and 64-inch Epson SureColor F7200 and F9200 leverage Epson UltraChrome® DS ink with an all new high density Black ink to deliver improved ink efficiency and black density with better tonal transitions and grayscale for high quality results in the roll-to-roll fabric production, customized promotional production, soft signage, and cut-and-sew sports apparel, fashion, and home décor markets. The flagship SureColor F9200 printer utilizes dual Epson PrecisionCore® TFP® printheads for high-speed, industrial-level roll-to-roll productivity with superior dot control and precise, repeatable performance. Each printer offers continuous productivity and less downtime with an integral and easily refillable, high-capacity bulk ink system and an improved post-platen heater for seamless media handling and faster drying times for continuous production. Epson F-Series Dye Sublimation lead the market in durability cost of ownership and productivity. Equipped with a highly accurate take up reel, the Epson SureColor F-Series allow for maximum uninterrupted production runs with minimal maintenance downtime. The printers also come with a Wasatch SoftRIP workflow that enables users to start printing sellable output immediately out of the box with specialty features for textile printing. A complete and proven dye-sublimation printer solution, the SureColor F-Series is compatible with Epson’s line of dye-sublimation transfer papers and designed to work exclusively with Epson UltraChrome DS Ink to ensure optimized output quality at industrial-level production1. Epson PrecisionCore TFP Printhead: Offers high-performance and consistency, along with variable size ink droplet technology for remarkable photographic print quality and accuracy. The flagship SureColor F9200 incorporates dual PrecisionCore TFP printheads to deliver high-speed, roll-to-roll productivity with output speeds up to 1,044 square feet per hour. Epson UltraChrome DS Ink: Epson-exclusive UltraChrome DS ink with all-new high density Black produces an extreme color gamut with improved black density for rich blacks and better tonal transitions and gray scale; provides fast drying times and improved ink efficiency for a low total cost of ownership. The SureColor F-Series printers are designed to be used exclusively with Epson UltraChrome DS inks and not with any other brands of cartridges or inks. Continuous High-Speed Roll-to-Roll Productivity: Highly accurate take up reel and substrate system deliver winding accuracy within ±2.5mm on transfer paper rolls. The F9200 allows for maximum uninterrupted production runs with minimal maintenance downtime, plus an integral and easily refillable, high-capacity 3-liter bulk ink system and improved post-platen heater allow for seamless media handling and faster drying times. Workflow: Wasatch SoftRIP enables users to print sellable output immediately out of the box with specialty features designed for textile printing. Epson DS Transfer Papers: Compatible with Epson’s dye-sublimation transfer papers, including the DS Transfer Production paper for high-volume customers (up to 575 feet per roll); DS Transfer Adhesive Textile for high-end cut-and-sew fabric and apparel production; and the DS Transfer Multipurpose for transfer applications with soft or rigid surfaces. The SureColor F-Series printers offer a standard Epson PreferredSM Limited Warranty, a one-year program that includes toll-free advanced telephone access Monday through Friday and usually next business-day on-site service in the unlikely event of any hardware failure. For additional information, visit www.proimaging.epson.com. Led by the Japan-based Seiko Epson Corporation, the Epson Group comprises nearly 70,000 employees in 94 companies around the world, and is proud of its contributions to the communities in which it operates and its ongoing efforts to reduce environmental burdens. Epson America, Inc., based in Long Beach, Calif., is Epson’s regional headquarters for the U.S., Canada, and Latin America. To learn more about Epson, please visit: www.epson.com. You may also connect with Epson America on Facebook (http://www.facebook.com/Epson), Twitter (http://twitter.com/EpsonAmerica)and YouTube (http://www.youtube.com/EpsonAmerica). Note: EPSON, SureColor, PrecisionCore, TFP, and UltraChrome are registered trademarks and Epson Exceed Your Vision is a registered logomark of Seiko Epson Corporation. All other product and brand names are trademarks and/or registered trademarks of their respective companies. Epson disclaims any and all rights in these marks. Previous post: Professional Plotter Technology is now selling Epson P-Series Large format Printers.